Meeting rooms are evolving into multi-usage spaces. This collaboration solution is designed to fit your meeting scenario, whilst perfectly fulfilling your needs for a powerful and scalable workspace. 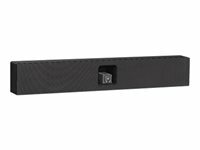 The NEC Collaboration Soundbar is the perfect solution for small meeting rooms and huddle spaces. Widen the objectives of your meeting and enhance your display with audio and video capability to be ready for conferencing and collaboration.